Based on a decade of private investigative practice and police officer work, the author brings to the forefront step by step procedures on a subject of investigation that gets little coverage today but is of vital concern to investigators, attorneys and law enforcement professionals. 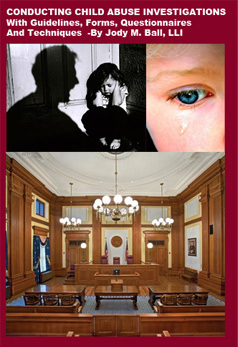 You'll find this investigative resource manual brimming from end to end with resources, questionaires, checklists, techniques, guidelines and helps on how to go about conducting an investigation of child abuse and gathering facts on child abuse issues. 8 1/2 X 11, 65 pages.